This is an audio-visual "Flash Cards" window to practice memorization and Speed Reading in Arabic. Each FCs group offers the Arabic words the student studied in that particular lesson. When the "Flash Cards" window is active, other navigation buttons are disabled until the specific window is closed. 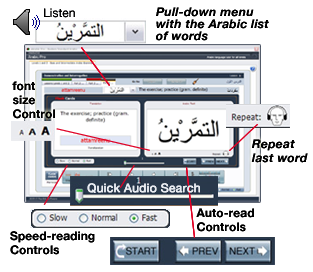 Available controls to help the student: Take advantage of this unique feature in this program include an auto-reading button (Repeat), three Flash Cards reading Speed Controls buttons (i.e., Slow, Normal, Fast), a Quick Audio Find search slider, a Font Size display control, Start the auto-reading button, a pull-down list of Arabic words, a Next word and a Previous word navigation buttons. That's all you need to help memorization. The "Flash Cards" window will display the Arabic word on the right, the English translation on the left half of the screen, and the word's Roman text Transliteration in RED below that for easy visual capture. Use the "Flash Cards" window to practice Speed Reading and to enhance your pronunciation in Arabic. A localized on-screen overlay "Help" is also available on the "Flash Cards" window. You can use the Auto Blend or the Manual Blend Level control to see the exact functionality of each part of the screen.